Dear Sir: - In the Horticulturist of November, 1857, were given some descriptions of our native grapes, among which was one of the Devereux. 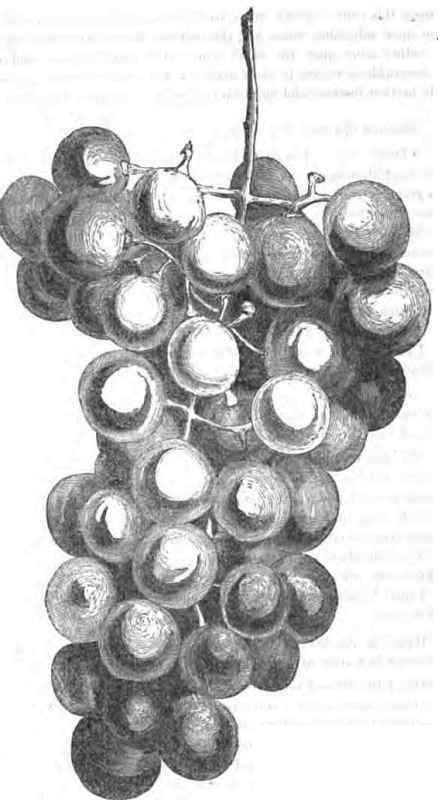 This grape, as first known here, proved the same as the Lenoir. But some very remarkable bunches were sent here to our first fruit exhibition, from Montgomery, Alabama, under this name, totally distinct from ours, and it was taken for granted that at last the true Devereux was obtained; a description was drawn up from this fruit and from vines from the same locality. Since then, Mr. R. Peters, of Atlanta, has obtained cuttings from the original vine received as Devereux from the woods, and on fruiting it tarns out to be identical with Lenoir, while the vines from Montgomery prove to bo identical with the Ohio in leaf and fruit. It was bunches of the Ohio of extraordinary size, which were exhibited here.
. Mr. Peters and myself are satisfied that there is no distinct Devereux grape. The Lenoir has been obtained wild in three localities, by the gentleman whose name it bears, in Sumpter district, 8. C, by Mr. Devereux in Hancock county of this State, and by the former in Forsyth county, from whom Mr. Thurmond obtained it, and has been grown under the names Lenoir, Devereux, and Thurmond. My seedlings of Lenoir in several instances now appear fac similes of the parent. With the exception of the Delaware, this proves our earliest grape, and it is a very desirable one from its freedom from rot and the excellence of its fruit. There is no more hardy vine grown. The Delaware has ripened here this season for the first time, and certainly is a step in advance of any other native. Whether it is earlier than Lenoir I am not quite sure, as the first blossoms of our vines were destroyed by frost, and the secondary buds broke very irregularly. I think it a trifle earlier than Lenoir, and decidedly sweeter. The Lenoir has a more brisk vinous flavor. I prefer both these grapes to Rebecca; no one who once possesses them will be willing to do without either. A word about ringing the grape-vine. Of two Isabella vines growing upon the same trellis, after the blossoms were well expanded, of the one a ring of bark was removed from a branch containing three bunches. These bunches ripened in July, were of unusually large size as to their berries, and of remarkable sweetness, for the variety, and I am greatly pleased with the result of the experiment. The other vine I intended to take out this fall, as they are getting too crowded on the trellis. Accordingly, I took off a ring from the body of the vine at the same time the operation was performed on the branch of its neighbor. The operation had no beneficial effect whatever. The grapes are no earlier and no larger. Now, is this an ordinary or extraordiny result? Did stopping the downward flow of the entire sap of the vine at that point so weaken or check the growth of the vine at the root and stem below the ring, that the nourishment of the upper part was not really increased, and the beneficial results expected were thus entirely lost. For the future I am disposed to ring so few bunches on each vine that its general growth and vigor will not be affected. I expected the vine would be sacrificed! but did not expect the beneficial effect of the operation to be thus counteracted. Does the experience of any of your readers correspond with mine, or is this an exceptional case? Yours truly, Wm. N. White. Dear Sir: - We have taken the liberty to enclose in a small box to you a parcel of grapes. We hope that the Delaware and Logan grapes we send to you may keep up the reputation of the varieties. These are part of a lot which Mr. Thompson, of Delaware, Ohio, sent to us for distribution: you see that the Logan is rather passe, but you see that it is compact, not loose: please tell us if they are as good as the Isabellas. Yours, in haste, Bissell & Salter. [The Logan in the state it was received was not equal to the Isabella. The Delaware, perfectly delicious. - Ed. H]. The Hartford Prolific Grape, a correspondent writes us, ripened Aug. 23d in Connecticut, and the 18th of the same month it has in one case attained maturity. Col. Dewey thinks it is rapidly winning public favor, and that its habit of dropping from the bunch is less conspicuous than at first. This opinion is confirmed by the Homestead. Dear Sir: - Don't laugh at me, but I will tell you a fact. On an Isabella grape-vine there is a bunch which is in close proximity to my lightning rod, and this bunch and this only of seve-ral hundreds turned of a deep black on the 20th of August, all the others being perfectly green. What does this teach us of the important uses which may be made of electricity? M. M. C.